America has made incredible strides against child abuse and stands to turn the tide against neglect through ongoing prevention and treatment efforts. Childhelp is proud to be a part of that. Communities and advocates that support strong, healthy families and happy, secure children are making a difference in lives right now. Medical and mental health interventions, enforcement efforts and public awareness campaigns are all strengthening child protection and reducing the impact of adverse childhood experiences. That has meant tens of thousands fewer victims this year than a decade ago and hundreds of thousands fewer than a decade before that. Nevertheless, every 10 seconds, there is a new report of abuse and every minute, a new victim. We know between four and five children still die every day from abuse and neglect and we know there are many uncounted who still suffer in silence. But we also know we have even more than hope for it to get better. We have your help. 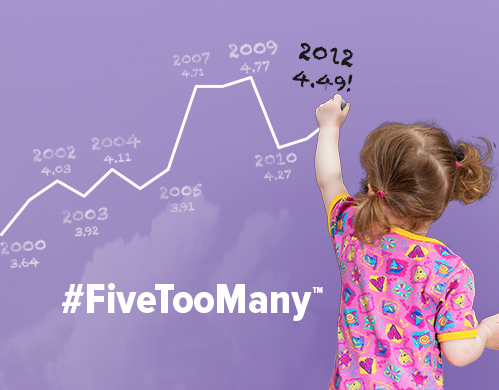 #FiveTooMany is a community campaign supported by Childhelp’s team of volunteers, child caretakers, social workers, medical professionals, administrators and advocates that aims to continue the success of Childhelp’s efforts against abuse, supporting successful intervention and treatment initiatives and nurturing prevention and outreach efforts. Together, we can take action against inaction. Together we can keep the five alive.